Chorus were struggling to get key information and news into mainstream publications. With no specialised tech writers delivering news to the general public, there simply wasn’t an easy way to get their messages out. So we helped them with a rather creative solution: making their own media channel. 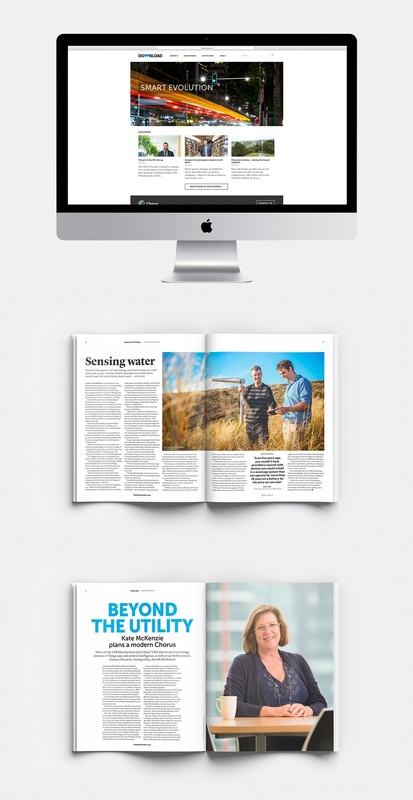 Download is a magazine, website and weekly email newsletter looking at the impact of fast broadband in New Zealand. Instigated and championed by Chorus, it examines the state and use of broadband across a wide range of areas – from home, education and health to the rural sector and SMEs. Through Download, key stakeholders, MPs and C-suite have access to unbiased information that’s easy to understand. Even though Chorus are behind it, all key providers have a chance to have their say. It’s work that requires intense collaboration, with ICG handling distribution and print as well as design and concept artwork. Like most things associated with the tech industry, ongoing evolution is key to success – and we’re currently up to issue #8 of Download! • The client was so happy with the initial results they added a weekly eDM. • Leading industry experts are known to quote information from the Download media channels.